Big Five number two! The top three teams from this meet will join the top three finishers from this afternoon’s MSU Big Five meet in the night session of the Big Ten Championships next weekend. The remaining two teams will join the fourth and fifth place teams from the MSU meet in the afternoon session. The top three here are pretty clear cut. Michigan is the easy favorite and will be looking to use this weekend as a tune up for the championships next weekend. Minnesota and Penn State should battle over the second place spot, but both teams should qualify to the night session, barring any meltdowns. If the Nittany Lions get through what can be a messy beam rotation cleanly, they will be feeling good. 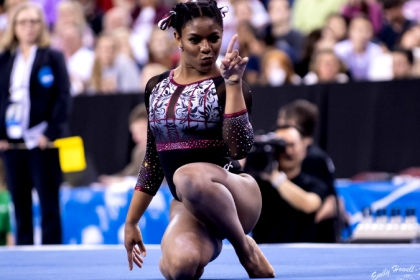 Minnesota needs to focus on putting up a solid six on vault, the Gophers’ problem event. Iowa could potentially catch either Penn State or Minnesota if one has a very off night, but the Hawkeyes likely won’t be able to do so without some major mistakes from the field. Rutgers’ focus here is putting up full lineups—last weekend the Scarlet Knights only put up four bar routines due to injury and scored below a 190—and pushing toward a 195. Syd Townsend (UM) – Vault: Townsend vaults an excellent Yurchenko 1.5 and has been getting closer to sticking it every week; is tonight the night? Emma McLean (UM) – Floor: McLean’s floor features huge tumbling and clean leaps; she has been performing a double tuck opening pass, but look for her to upgrade soon. Ivy Lu (Minn.) – Bars: Lu is a gorgeous bar worker, and is ranked No. 3 on the event. Lexy Ramler (Minn.) – Beam: Ramler’s calm and confident beam work has her ranked No. 4; look for her stellar toe point. Lauren Bridgens (PSU) – Bars: Bridgens’ clean bar work earned her a 10.000 last week. Briannah Tsang (PSU) – Floor: Tsang is an outstanding all arounder, and floor is perhaps her best. She performs a clean piked full-in. Nikki Youd (Iowa) – Beam: Youd is a confident and clean beam worker capable of big numbers. Look for her celebratory grin if she nails her series. Lanie Snyder (Iowa) – Floor: This is one of my favorite floor routines in the nation; Snyder is an extraordinary performer and her rock medley is tons of fun. 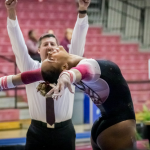 Jenna Rizkalla (RU) – Vault: Rizkalla recently unveiled the return of her Ilg vault—the only one in the Big Ten. Makenzey Shank (RU) – Beam: Shank has an elegant and confident beam set, highlighted by an almost always steady Liukin. A brief disclaimer regarding BTN: We will only see highlighted routines, likely focused on the top of the field, so expect a Michigan-heavy experience. I’ll blog every routine we see, but we will certainly miss quite a few. PHEW the early session was a whirlwind! Illinois, Maryland and Ohio State will be advancing to the evening session of Big Tens next weekend. Nebraska and Michigan State will be in the early session. HERE WE GO! Last time Michigan was in the RAC it took home the Big Ten title. What will see the Wolverines do tonight? Minnesota great Lindsay Mable is commentating tonight. Polina Shchennikova (UM): FTY, some pike, just a teeny hop straight up. They could give her the stick. Nikki Youd (Iowa): Jumping into the middle of her routine. FHS front lay front full, lands low and biggish step forward; she was archy on the lay and didn’t get a great block. FHS rudi, nice. Lexi Funk (UM): FTY big, tiny hop back. She was a touch piked in the air. Olivia Karas travelled with the team, and is wearing her Big Ten champs ring. Brianna Bronw (UM): FTY, sloppy block some legs. Offline as well. Mary Korlin-Downs (Minn.): Side aerial bhs, offline and she falls. Beat + split + split 3/4 great amplitude. Cat + gainer full off the side stuck. Great recovery after a fall. Paige Zaziski (UM): FTY huge, flairs it. Great vault. Kristen Politz (PSU): Pretty toes and lines. Blind + Jaeger + bail, solid. Blind + Double front, tiny hop. Great set. Emma McLean (UM): FTY, dropped her chest. No 1.5 tonight. Nicole Chow (Iowa): We saw her last pass, a double pike. Good, just flexed feet. Lauren Bridgens (PSU): She had the 10 last week, what will she do here!? Maloney+ bail hand great. Toe shoot. Arched a bit on last handstand. Giant full + double tuck little slide. Ciara Gardner (Minn.): Hitch + gainer full, stuck. Great landing. Charlotte Sullivan (Iowa): Jumped into the middle. Double tuck, huge, slides front foot back on the lunge. Switch ring + switch full. Great attention to detail in her dance. Sabrina Garcia (PSU): Piked Jaeger Bail hand, excellent handstand. DLO stuck. Great set. Selena Ung (Minn.): Bhs + gainer full, small hop. Dear camera people: more Minnesota beam please! Melissa Zurawski (Iowa): This is such a dramatic and intense routine. Double pike, landed a little low in the knees. FHS front full front pike, just a little loose. Switch side popa popa, love to see two popas in a row! FHS rudi, slightly short on the rotation and pikes it down a touch. Lexy Ramler (Minn.): Side aerial + full, stuck. Frustrated we missed this routine! She can be stellar here. Lanie Snyder (Iowa): Snyder is DYNAMIC on floor. I love this routine. Punch front through to double tuck, lands a bit low. FHS front lay front full, nice. Tour jete half popa, nice. Her facial expressions are amazing. Double pike, nice, just a bit of a big lunge. Well, those are not quite the scores any team was looking for. Michigan was decent but not amazing on vault. 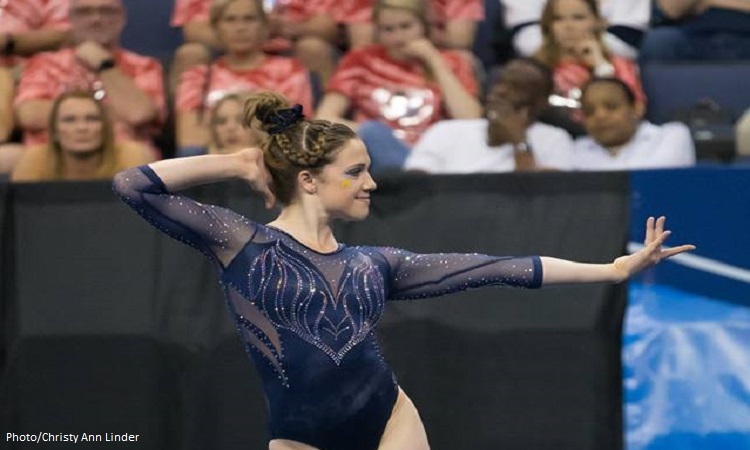 The Wolverines played it safe, having McLean only vault a full. Iowa had no disasters on floor, but also no very high scores, perhaps partially a symptom of starting on floor. PSU counted a 9.525 from Ava Verdelfor as well as a fall from Tsang, because Tess McCracken also fell. Not a great start on the Nittany Lions’ best event. Minnesota also struggled, with three falls. The Gophers are on bye next, so they’ll have time to regroup. A side note: Mable is a very solid commentator! Loving her so far. Hannah Prieto (RU): FHS rudi, nice. Orphan standing back tuck. FHS front lay front full, just a touch arched. Double cat leap! Little shuffle out. Solid two pass routine. Good start. Misty-Jade Carlson (Iowa): FTY twists early and flexed feet, but nice body in the air. Bridgens (PSU): Hitch + front toss, solid. Switch + tuck 3/4, no problems. She looks calm on the beam. Bhs loso, little off, drops a shoulder a bit, but not a huge correction. RO 1.5, small hop forward. Nice routine. Zurawski (Iowa): FTY, STUCK. Just some knees in the air. Funk (UM): Giant full + GIGANTIC Tkatchev, little messy. Bail. Mable wondering if she clipped her foot on the Tkatchev. DLO, teeny hop back. Snyder (Iowa): This Hawkeye team looks loose and happy dancing. FTY clean, piked a touch and hop back and to the side. Shechennikova (UM): TOES. Maloney. Pak, lovely. Giant full + double tuck, maybe held the stick, shuffled to salute. Nikki Youd (Iowa): Yhalf, little piked and hops forward a bit. Riahannah Ali (RU): Joining in the middle of her set. HUGE popa. Double pike, chest a big low. Split full + tuck full nice. Zaziski (UM): Tkatchev, giant. Great handstands. Bail hand toe shoot. She ATTACKS handstands. DLO, sort of stuck. Shuffled one foot a teeny bit, not sure if judges saw (it was right in front of the camera). 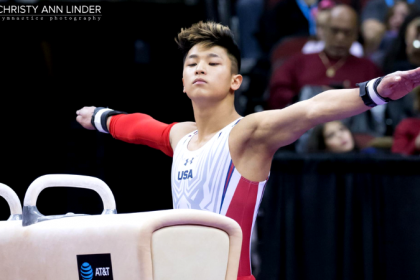 Tsang (PSU): Standing loso loso, turns to side, maybe a .15 deduction. Cat + switch side. Side somi, way off and she falls. Not her night. Bhs 1/1 + layout full. Brown (UM): Ray, huge. Good handstands. Toe hand. Pak, great lines. DLO step to the side. Mason Hosek (PSU): Pressure to hit after Tsang. Little correction on full turn. Side aerial, and she falls. PSU counting a fall here. Bhs loso, solid. Switch + straddle 1/4 solid. Front aerial + beat secure. Cat + gainer full stuck. Nice finish. Belle Huang (RU): My feed keeps sticking in the same spot. Will jump in when it returns! Seems to be a Hulu glitch. FHS rudi, nice. Jenna Rizkalla (RU): Rudi loso, nice, little wild on the lunge. Switch side popa tuck full, not the biggest straddle, but good rotation. FHS double full, nice, just some knees. Great routine. Great bar rotation for Michigan. The Wolverines are rolling and should be feeling good after two. Iowa was clean on vault and is capitalizing on mistakes from PSU and Minnesota. The Hawkeyes may sneak into the night session. PSU is now heading to bye, with the opportunity to calm down and reset after a rough start. Minnesota is coming off bye to one of its best events, so look for the Gophers to have regrouped and go big on floor. Rutgers had an excellent start, and will be looking to follow in Iowa’s footsteps and try to capitalize on the other teams’ mistakes. After two, it seems clear that scoring here is tight. Not absurd, but classically Big Ten strict. Funk (UM): Bhs loso no problems at all. Switch half + pike, nice. One of the best she’s done recently. Beat + popa, solid. Side aerial + full stuck. Wow, great leadoff. Rachel Cutler (Minn.): Jumping in at her last pass. Double tuck, nice landing. Zaziski (UM): Cat + switch side, nice. Bhs loso solid. She’s calm on the beam. Switch + straddle 1/4. Front toss, waves arms and hops forward a touch. Gainer full off the side, stuck. Good set. Michelle Amoresano (RU): Yhalf, bounds forward. Announcers mis-ID’d as Rizkalla. Toni Williams (RU): FTY, leg sep on table, piked a bit and stuck. Shchennikova (UM): The press mount, the toes, so much pretty. She moves very calmly. Bhs loso, solid + split jump, not quiiiiite connected. Front aerial. Beat + sheep, secure. Side aerial + full, low chest and fights, but steps forward. Zurawski (Iowa): Hect mount. Giant full + Geinger, nice some leg sep. Bail hand. Giant full double tuck stuck. She’s having a great night. Gardner (Minn.): Looong wait for the judges. FHS rudi loso, not the highest, Mable saying she may have been OOB but couldn’t tell on camera. Switch half popa, huge. Double tuck, jumps up on the landing, but great chest position. She’s really performing her choreo. Lauren Marinez (UM): Jump split mount. Front aerial bhs loso, nice, the tiniest bobble.Cat + side aerial. Split + split half, not quiiite around and back leg a bit low. RO double crossed legs but stuck cold. Chow (Iowa): Great first handstand, Ray, huge. Bail. Giant full some leg sep double tuck, small slide. Great routine. Paige Williams (Minn.): Performing from the second her music starts. Intense look on her face. She’s here to play. FHS double full GORGEOUS. Great landing. Switch side popa, nice. 1.5 front lay, nice. She really floated the lay. FHS rudi, solid. Excellent routine for the Gophers. 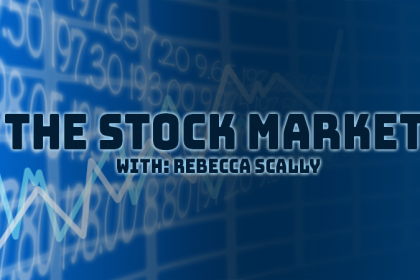 Ramler (UM): Bit of a long wait. Ring full, lovely. Double pike, big, good landing. Huge performance equality, wonderful details from her toes to her head. 1.5 front lay, great landing. Switch ring. Switch half. Double tuck, lands with chest a big low. Phew this one is shaping up to be surprising just like the first session! Michigan is easily sailing and will look to use the bye to get set for a big floor rotation to close it out. Iowa continues its great meet with a big 49.1 on bars. The Hawkeyes are definitely taking advantage of PSU and Minnesota’s rough starts. Rutgers is also capitalizing. Minnesota came back strong, but still has some fighting to do to push into the top three. Penn State hopefully reset during the bye and can use floor to regain some footing here. Kristen Politz (PSU): 2.5, gorgeous in the air, just a step to the side. 1.5 front lay, lost some height on the lay. I missed her jump, but it was a touch wild. Garcia is JUMPING behind her. 1.5 punch front, steps out. Took maybe two steps, maybe three. Gardner (Minn.): FTY HUGE, lovely, tiny pike down, good landing, just hops up. Rachel Ley (RU): Clear hip hand. Bail hand solid. Little shy last handstand. DLO pretty! Big step back. Alissa Bonsall (PSU): She looks anxious, coach Brown trying to get her to loosen up. These floor judges are killing me. Waits for every floor team. Here we go. Aaaand camera cut away. Charlotte Sullivan (Iowa): Front aerial bhs, nice, great extension. Switch half + beat, solid. Side somi secure. RO double, small hop, crossed legs. Ramler (Minn.): FTY, gorgeous body position, good landing, just a small hop. Breanna Fitzke (Iowa): Very crisp movement. She’s confident. Love her details, hands. Bhs loso, ooh, misses front foot a bit, slides off the side, so a fall. Switch + straddle 3/4, medium adjustment. Side aerial + tuck jump, solid. RO 1.5, small hop. Youd (Iowa): Some pressure now with the fall. Front aerial bhs loso solid. She’s attacking every movement. Switch + split, solid. Cartwheel + gainer full off the side, small hop back. Bridgens (PSU): Huge double tuck, drops the landing right in. FHS rudi loso, nice, great twisting position. Switch half + wolf fullish, wolf pretty wonky, not around. FHS front full front lay, hops forward. Solid, just tiny things and that wolf. Abby DeMuse (Minn.): FTY, nice! Just a small hop. So good to see her back post ACL and a host of other injures. Garcia (PSU): Big double tuck, steps back OOB. Great performance in her movement and face. Double pike, nice! Much better landing. Switch side popa nice. 1.5 front lay, very archy but good landing. Chow (Iowa): Bhs layout two feet, misses and falls. That one hurt. Foot slid down the beam, ginger on ankles. She salutes and she’s done. Rough way to end for Iowa. Tsang (PSU): Piked full in HUGE, fairly controlled lunge out. 1.4 barani, nice. Double pike, lands deep in her knees, but holds the landing. Nice recovery from her first two events. Iowa’s night is done; now the Hawkeyes wait and watch. Chow’s tough fall is a challenging way to end this meet. Hopefully we’ll see her back next weekend. A usual floor rotation from Michigan will easily take the Wolverines into first over Iowa. Minnesota is closing in on Rutgers. Minnesota is a solid bar squad and has the advantage over a Scarlet Knights team that sometimes struggles on beam, especially if Makenzey Shank, who was missing from bar and floor lineups, is out of beam. Penn State is still fighting. The way this meet has gone, who knows what could happen. Larissa Libby saying that Chow has been struggling with an injury, so perhaps stopping beam was more about protecting her long term than about a new injury tonight. Syd Townsend (UM): Front through to double tuck, nice. Tour jete half popa, nice. Double pike, little deep in the knees but covers well. Whip double full, little wild legs, but good landing. She has been working on her performance quality. Bonsall (PSU): FTY clean, small small hop, and a bit off to the side. Shannon Ferrell (RU): There was a fall in the leadoff, so pressure is on! Beat + side aerial solid. She is calm. Bhs loso, biggish adjustment, lifts leg. Switch + split, small wobble. Split 3/4. RO 1.5, big step back. Tried too hard for a stick. Funk (UM): Double pike, very big, good landing. Switch side popa, great splits and rotation. Front full front lay, very floaty, nice. Double tuck, some feet but great landing. Very good for the Wolverines. Gianna LaGuardia (PSU): FTY, pikes down and a step. Not her best. Rachel Rowland (Minn.): Blind + Jaeger HUGE + bail. Great lines. Stalder + toe on front tuck. Nice! That is one of the biggest Jaegers you’ll see. Bridgens (PSU): Y1.5 nice! Just some knees. Glad to see her throwing the bigger vault. Ramler (Minn.): Just her lines. Maloney pak, gorgeous toes. Shaposh half, Toe hand full-out stuck. That was superb. Brown (UM): Coming in partway through. 1.5 front lay some arch. Ivy Lu (Minn.): Toe hand Maoloney pak, gorgeous. Great final handstand! DLO, stuck cold. Ramler + Lu is a VICIOUS 1-2 punch. Zaziski (UM): Double pike, huge. Tour jete half popa, no problems. She looks calm. Front lay front full, little wonky on the full takeoff but pulls it out. Doulbe tuck, chest a touch low, but good control. Libby Groden (RU): Bhs loso, some bent arms in the bhs but very secure. Liukin, nice. Beat + switch + switch. She has a very calm presence. Gainer full stuck. Great routine. McLean (UM): Double tuck, giant. Slides front foot a touch. Tour jete half popa, big splits. Front lay front full, drops the landing right in. Double pike, great landing. Really excellent routine. PHEW WE MADE IT. Michign sailed through. The Wolverines are confident and prepared. This 24 for 24 showing is a great step in their mission to win a fifth Big Ten title next weekend. Iowa surprised and slipped into the night session, having a steady performance while some of the field faltered. Minnesota came back with enough on bars to take over the third place spot. Penn State and Rutgers will join Michigan State and Nebraska in next week’s morning session. Keep in mind that seeding for Big Tens doesn’t REALLY matter: any of the ten teams can win. Scores just tend to be higher at night, and the crowd is usually bigger.